Even more leaked components of the new iPhone and iPad mini have given more clues to the probable designs. It's not anything we've not seen before, but possible pieces of the new devices have been 'uncovered' by iResQ that seem to confirm a redesign. The notion of a smaller dock connector has been reinforced, with a 9-pin option being the most likely. According to Apple Insider, this would be an 8-pin configuration with a ninth coming through the metal in the surrounding shell. Do you care? Probably not – but it does mean faster data transfer and a more reliable connection, even though it's a smaller component. And remember when we told you about the headphone jack being moved to the bottom? 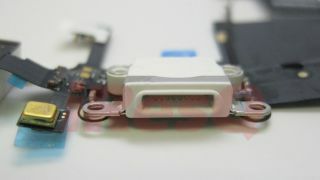 Well, these parts also suggest the same thing – whether this will annoy Apple fans used to taking their phone out of a pocket in a certain way is yet to be seen. Of course, it could be that the iPad mini is the one in line for the moved headphone jack, with another more traditional configuration set for the iPhone – but these photos seem to suggest otherwise. It's just over three weeks until we may get to see the new iPhone 5 in the metallic, two-tone flesh – best start buying those camping supplies now if you're going to queue for it.